In the fantasy world, everyone wants to be at a place which is world’s most amazing places and if that welcomes you with great hospitality what else you really want. We are here to talk about the luxurious hotels with exotic views. These are the hotels where you can enjoy the modern facility with natural beauty. Isn’t it a great combination? If you are planning for honeymoon family trip or even adventurous trip you just need to look down to this list and choose your place. A home away from home, where one can find peace, adventure, love, nature etc. The only hotel in Torres Del Paine National park situated in Central Patagonia. The Patagonia Hotel Ledge was opened in year 1993 on the banks of the Salto Chico Waterfall. UNSECO has declared the landscape of Torres Del Paine as a biosphere reserve. The hotel is situated at the center of Patagonia’s 598000 acres area, Created by the award winning chileon architect, Germen Del. It is called as a land of “Four Season in a Day”. Rainfall suddenly turns into snow squalls followed by Glaciers Winds And then Sunny skies. Amazing scenery from each corner of the hotel makes you to not to move from that part of hotel hence you will need time to visit from one part to another part of hotel. You will find Haute cuisine and luxury lodging with complement of blue skies and colorful mountains. Manafaru is one of the several Islands of Republic of Maldives. The island consists of several hotels and resorts including Beach House. The beach house gives one the feel of being in the middle of paradise surrounded by crystal blue water from all the sides, in total seclusion. The resort has all the facilities that one would expect at a beach house resort. The resort also offers seaplane to its customers on demand. The resort is more commonly known as JA Manafaru. Banyan tree Al Wadi is a desert resort and the first one to offer all pool-villa concept in United Arab Emirates. The hotel has 3000 square meter area of Asian-inspired spa facility. The hotel also has a nature reserve, a private beach club and a golf championship course having 18 holes. The hotel’s nature reserve offers its guest an opportunity to interact with local desert wildlife that includes Camels, Oryxes and Arabian Gazelles. Spread in an area of 9,000 acres of ground, St. Regis Princeville is situated in Kauai Island in Hawaii. The hotel provides the guests with amenities that one would expect from an island resort. The resort has astonishing rooms that provide superb view of Makana Mountains and Hanalei Bay. The hotel has custom furnishings and marble bathrooms with many rooms having private terrace.. 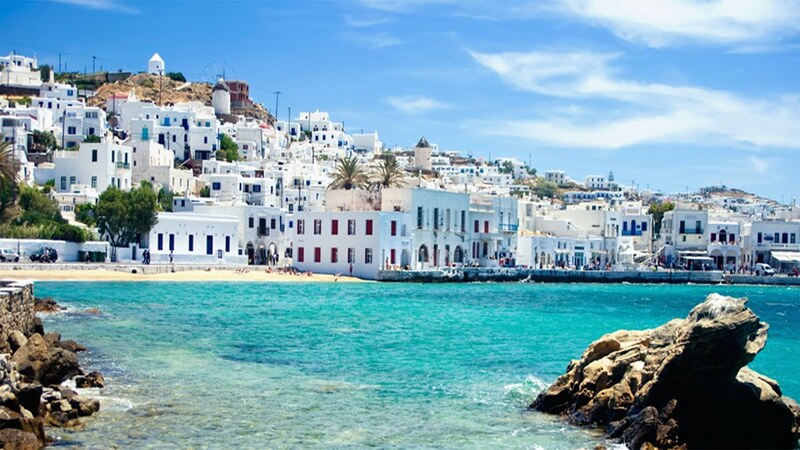 The Mykonos Blu is a luxury resort situated in the city of Greece on a low deception overlooking the beach at Psarou. The hotel provides spell binding view of the crystal blue water from its two-Suite Villa. As the beach is mainly famous for sunbathing and partying, the hotel is famous for serving breakfast as late as 6 PM. The five star Mandarin Oriental at the 35th to 54th floors of Time Warner Centre in Ney York City was inaugurated in the year 2003. The hotel has as many as 202 guest rooms and 46 suites for its guests. It provides the mesmerizing views of the Central park and the Hudson River. The hotel has a Spa, a Restaurant known as Asiate, a Lobby Lounge and a Bar named as MO Bar. Rome’s 2,000 years old Kolojiam can be seen from the Palazzo Manfredi hotel rooms. The building of Hotel Palazzo Manfredi has its origin dating back 2000 years ago. The hotel is situated in the heart of the Rome. The hotel has rooftop terraces overlooking the collegium and also has an amazing restaurant at the top floor. From the balcony of the Mandarin Oriental Hotel which is located in San Francisco can be seen the Golden Gate, Elktrej Island, Tronsmerika pyramid. Located in the top 11 floors of the 345 California Center on 222 Sansome Street in San Francisco at California, The Mandarin Oriental is a luxury hotel. The twin towers at which hotel is situated is at 45 degrees angle in comparison to rest of the building. The hotel has several skybirdges that provides an awesome view of San Francisco. 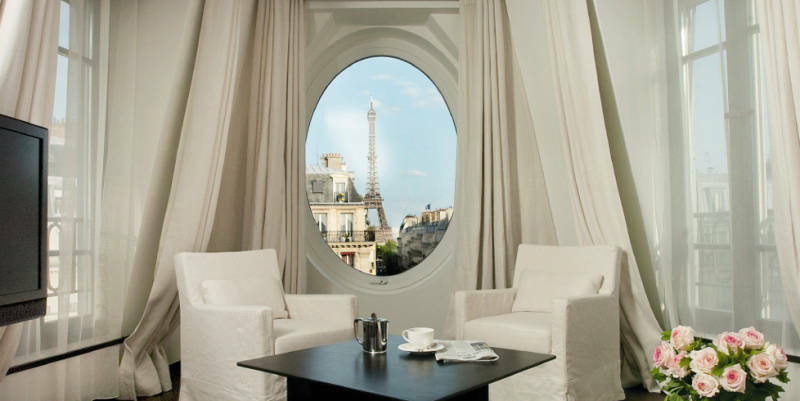 With 38 rooms and 10 suites The Radisson Blu Le Metropolitan is situated one kilometer away from Eiffel tower. The hotel has a sophisticated and understated style designed by François Champsaur. The biggest charm of the hotel is that one can see the Eiffel tower from the rooms of the hotel. It is located in 16th arrondissment near the Trocadero.